This is housed in The Keep, which is the entrance to the former Dorset Regiment barracks. Displays include pictures, uniforms, medals and weapons. An unusual exhibit is Adolf Hitler's desk, taken from his Berlin Chancellery by the Dorset Regiment in 1945. This photo was taken between a rare gap in the traffic. The road markings have been surgically removed, and this gives some idea of how the building looked a century or more ago (apart from the Velux window!). South Street is on the right, in front of the pink-washed building. The museum interior is of considerable architectural interest and houses collections which illustrate Dorset's history from the Stone Age to the present century. geology, natural history, archeology and local history are covered including finds from Maiden Castle. The museum's Thomas Hardy Collection includes manuscripts and possessions housed in a reconstruction of his study. A bustling pedestrian shopping precinct which has market stalls on most days. The old Antelope Hotel has been imaginatively used as the entrance to this delightful shopping arcade. "This house is reputed to have been lived in by the Mayor of Casterbridge in Thomas Hardy's story of that name written in 1885." Michael Henchard was the character. In Hardy's 'The Mayor of Casterbridge' Susan Henchard is able to see through the curved bay window projecting over the pavement, the husband who had sold her many years before. Hardy uses the Kings Arms many times in novels and poems. This fine old inn serves excellent food and ales in a cosy atmosphere. This peaceful tree-lined avenue leads to a striking bronze work commemorating the Christian Martyrs. The work is by Dame Elisabeth Frink, who spent much of her life in France. Her last years were spent living and working in her studio at Woolland in Dorset. This statue at Top-o'-Town was unveiled by Sir James Barrie in 1931. Thomas Hardy's heart is buried in Stinsford churchyard, and his ashes were interred in Poets' Corner in Westminster Abbey. 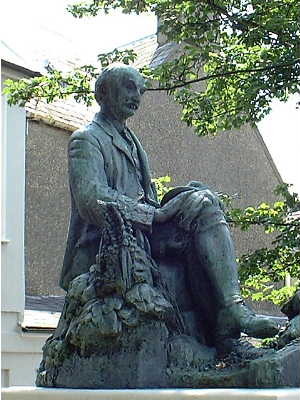 This life-size bronze statue of the poet was unveiled in February 1889 and stands beside the porch of St Peter's Church in High West Street, Dorchester. He is buried in the graveyard of his church at Winterborne Came, south-east of Dorchester. The Green with St George's Church in the background forms the focal point of this village within a town. The River frome flows nearby.